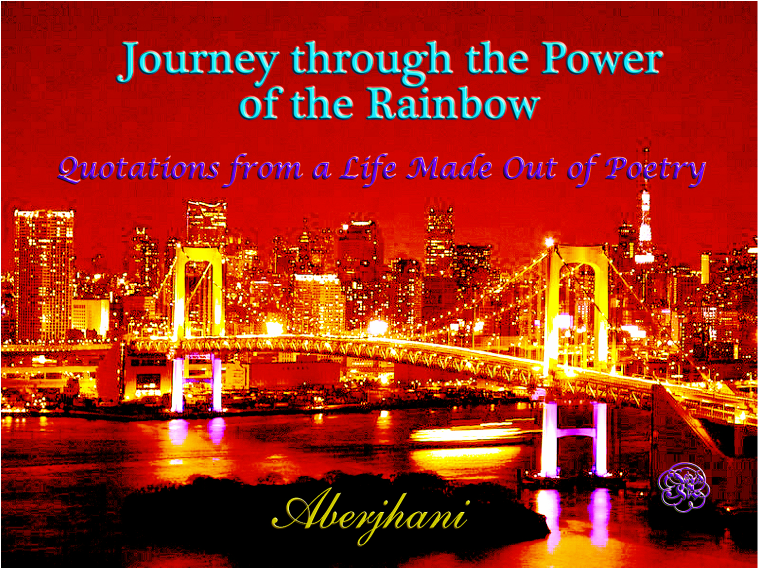 Photograph of Tokyo Rainbow Bridge by Gussisaurio with quote by Aberjhani. Permission to use Image granted per Wikipedia Creative Commons Attribution Share Alike license. The Journey and the Rainbow website takes its theme and substance from this famous haiku quotation: “Dare to love yourself as if you were a rainbow with gold at both ends.” To love yourself is to undertake the amazing journey of discovering and empowering the best version of who you are, or that which you wish to become. This simple quote has helped to inspire many people to do exactly that. It is a quote that originated with the poem “Angel of Healing: for the Living, the Dying, and the Praying,” which itself was part of the celebrated Songs of the Angelic Gaze series. That series of poems as a whole is currently part of The River of Winged Dreams collection. From a feel-good buzz shared throughout online communities on Facebook, Tumblr, Twitter, Pinterest, Google+, and elsewhere, the concept has grown to inspire motivational blogs, encompass works of visual art, encourage strivers to reach for their goals, and generate dialogues on the power of positive thought. It has also developed into a book, Journey through the Power of the Rainbow, filled with powerful observations gleaned from decades of reporting through journalism, poetry, historical writings, fiction, and genre-bending works on the ever-evolving human condition. With that in mind, the site’s blog is titled Inside the Wisdom of the Rainbow and features responses from and to various individuals and groups regarding the “Dare to love yourself” quote. It will also showcase excerpts from the forthcoming book, which previously took its working title from the quotation itself, but which may very change to something else during the final edits. The current unofficial movement dedicated to committing love to oneself is not about the kind of narcissistic conceit that drives individuals to become so infatuated with overblown self-importance that virtually nothing or no one else in the world exists for them. That kind of self-absorbed obsession is more about neurotic imbalance than love and is anything but healthy. It prompts individuals to believe that human beings other than they are nothing more than stepping stones to reach a given self-centered goal, or simply ready-made audiences designed to applaud their various exploits. To love oneself in a positive manner is to recognize and demonstrate respect for the value and beauty that your life inherently possesses. Social observers have long known that the lack of such recognition can result in a number of disturbances ranging from low self-esteem and serious depression–– to repeatedly failed expectations and thoughts of self-destruction, or even worse: the destruction of another. Recognition of self-worth helps to establish a balance between inner harmony and external requirements. Instead of depleting enthusiasm or efficiency, it increases them. In short, it tends to be a good thing. Change is one of the scariest things in the world and yet it is also one of those variables of human existence that no one can avoid.